Petra Guasti, Zdenka Mansfeldová, Z. (eds. ), Democracy Under Stress. Changing Perspectives on Democracy, Governance and Their Measurement. Changing Perspectives on Democracy, Governance and Their Measurement. Prague: Institute of Sociology of the Czech Academy of Sciences, 2018. 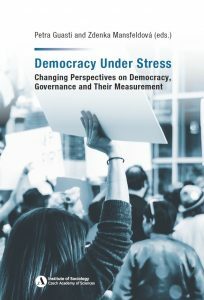 The book provides a range of perspectives on the study of democracy under stress. The authors, renown scholars of democratic theory and democracy in the Central and Eastern Europe, highlight the potential of different approaches – from comparative meta-assessment using indices and survey data, to case studies focused on understanding context and causal processes – for a better grasp of the loci of the stress. Printed version available on request at prodej@soc.cas.cz.